Jamaica Bay is part of a complicated environmental system that is subtle and extreme. This system, which exists within metropolitan New York City, strikes a balance between urban and natural. 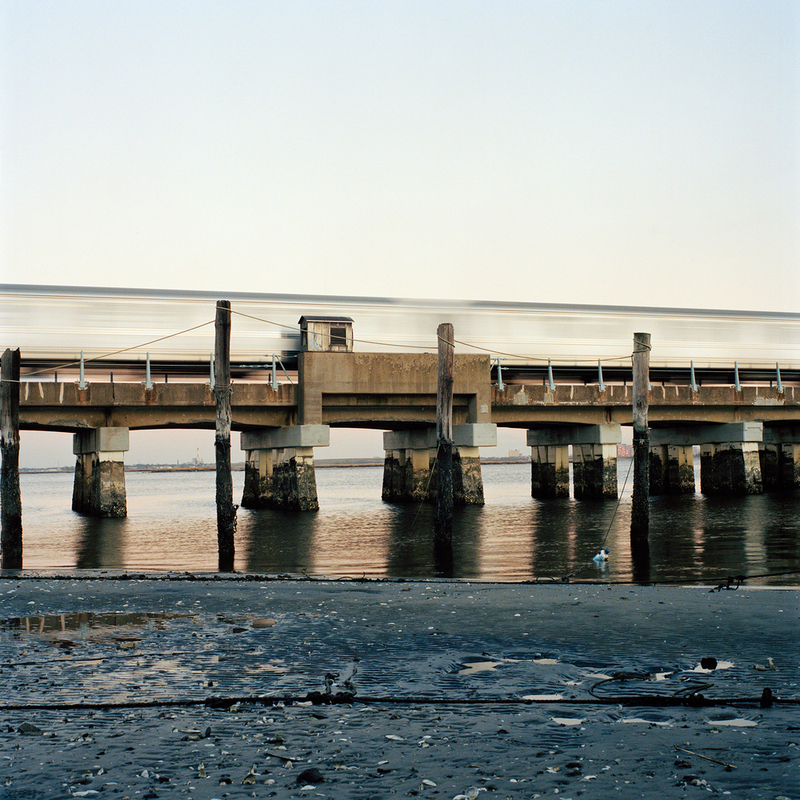 I began photographing the island of Broad Channel, which sits in the middle of Jamaica Bay, in 2004. I was attracted to the island’s unusual character and insular community. Backyard canals and docks allow residents access to the waters of Jamaica Bay. Nearly every home has some form of watercraft parked nearby: motorboat, sailboat, canoe, kayak, Jet Ski. Public streets are stilted boardwalks constructed over grassy saltwater marshes. At the end of these streets, structures are clustered together to form small blocks of houses. Within each block there are abandoned buildings and year round residences. The island’s dead end streets give way to views across the complex of saltwater bars, marshes, and boat channels that make up Jamaica Bay. In the distance, Manhattan skyscrapers are visible on the horizon. The northern half of Broad Channel is designated The Jamaica Bay Wildlife Refuge. Resting migratory birds share space with subway trains transporting commuters to and from Manhattan. While the land was abundant it was misused; the evolution of the city and population growth has forced a balance between natural and urban environments. All of New York City has history shaped geography which has evolved according to its previous use, often configured because of industrialization and development. This evolution can be seen in Jamaica Bay. Broad Channel was originally a series of islands that have been connected using landfill and dredging from the bay. Dead Horse Bay and Barren Island, both on the southwest shore of Jamaica Bay, were named for the horse rendering and garbage burial industries that settled there. Buried garbage was used to connect Barren Island to mainland Queens, and in the 1930’s, the property was converted into Floyd Bennett Field, a military airstrip. Though it was heavily used during World War II, the runways have been transformed into shared parkland used by the US Naval Reserve, the Coast Guard, the NYPD, model airplane enthusiasts, and community gardeners. Rockaway oysters and clams were once an economic staple of the bay. During the early 1900’s, millions of gallons of untreated waste were dumped into the bay. The water became so polluted the Department of Health abolished shell fishing, a ban that continues today. JFK International Airport occupies 4,930 acres of land adjoining the bay. In 2003, 280,032 planes moved 31,732,466 passengers to and from New York via runways that protrude into the waters of the bay. With the support of a Photo Urbanism Fellowship from the Design Trust for Public Space (NYC), I spent two years photographing Jamaica Bay. I focused on the coexistence of the urban industrial environment, preserved natural environment, and seasonal changes. My photographs reflect the state of the bay in 2005/2006, while revealing the awkward history and the complicated habitats that exist. The project culminated in a solo exhibition at the Museum of the City of New York.